Phenix City lies immediately west across the Chattahoochee River from much larger Columbus, Georgia. Sometimes called Hub City, Phenix City is included in the Columbus, Georgia-Alabama Metropolitan Statistical Area Columbus, Georgia metropolitan area, but a section is located in Lee County, and is, therefore, in the Auburn, Alabama metropolitan area. Phenix City is located at (32.472822, -85.020121). It is the easternmost settlement in the state of Alabama as well as the Central Time Zone, but it uses the Eastern Time Zone, due to the city's proximity to the state of Georgia. According to the U.S. Census Bureau, the city has a total area of 24.8 square miles (64 km2), of which 24.6 square miles (64 km2) is land and 0.2 square miles (0.52 km2) (0.61%) is water. The climate in this area is characterized by relatively high temperatures and evenly distributed precipitation throughout the year. According to the Köppen Climate Classification system, Phenix City has a humid subtropical climate, abbreviated "Cfa" on climate maps. What some claim was last battle of the Civil War took place in Phenix City, then known as Girard. What is Phenix City today initially began as two towns bordering each other on the north and south. On the south side was Girard, in Russell County, and the town of Brownville, on the north side, which was entirely within Lee County. Because a community in Tuscaloosa County already claimed the name of Brownville, the post office insisted on the name of "Lively." To compound the confusion, the nearby railroad depot was called Knight's Station. Because residents preferred Brownville, on the 1880 U.S. Census, it was listed as both Brownville and Lively. It was formally incorporated by the legislature on February 23, 1883. Within the decade, the name would be changed to Phenix (or Phenix City), although some misspellings had it as "Phoenix." It was not clear if it was named for Phenix Mills in adjacent Columbus, Georgia, or for the fabled bird. It appeared as Phenix City on the 1890 U.S. Census and was incorporated as such on February 19, 1897 by the state legislature. On August 9, 1923, Russell County's neighboring Girard (which made up most of current downtown Phenix City) and Lee County's Phenix City formally merged, keeping the name of Phenix City. 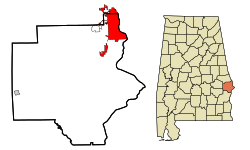 Because the consolidated city still remained divided into two counties, in 1932, the Lee County portion was moved entirely into Russell County (also cited for the redraw was to account for population shifts involved in the Auburn University opening and expansion). Lee County received the rural segment centered on Marvyn as compensation, which was formerly in Russell County's northwest corner. In 1926, the Russell County portion of Phenix City was designated the second county seat (the seat from 1868 had been at rural Seale). In 1934/35, Phenix City then became sole county seat. In 1955, it won the All-America City Award from the National Municipal League. Curiously, despite the city having been entirely annexed into Russell County in 1932, the growth of the city has spread northward back into Lee County, where it first appeared on 1980 U.S. Census records. As of 2010[update], nearly 4,200 residents (out of almost 33,000) reside in the Lee County portion, almost exactly the same number that lived in Phenix City in 1910 (which was then entirely in Lee County). As of the census of 2000, there were 28,265 people, 11,517 households, and 7,566 families residing in the city. The population density was 1,149.1 people per square mile (443.6/km²). There were 13,250 housing units at an average density of 538.7 per square mile (208.0/km²). The racial makeup of the city was 52.94% White, 44.97% Black or African American, 0.23% Native American, 0.53% Asian, 0.02% Pacific Islander, 0.56% from other races, and 0.76% from two or more races. 1.49% of the population were Hispanic or Latino of any race. There were 11,517 households out of which 31.7% had children under the age of 18 living with them, 39.4% were married couples living together, 22.1% had a female householder with no husband present, and 34.3% were non-families. 30.4% of all households were made up of individuals and 11.5% had someone living alone who was 65 years of age or older. The average household size was 2.40 and the average family size was 2.99. In the city, the population was spread out with 26.3% under the age of 18, 9.6% from 18 to 24, 28.7% from 25 to 44, 21.2% from 45 to 64, and 14.2% who were 65 years of age or older. The median age was 35 years. For every 100 females there were 86.2 males. For every 100 females age 18 and over, there were 80.4 males. The median income for a household in the city was $26,720, and the median income for a family was $33,740. Males had a median income of $28,906 versus $21,348 for females. The per capita income for the city was $14,619. About 18.8% of families and 21.3% of the population were below the poverty line, including 29.5% of those under age 18 and 20.6% of those age 65 or over. As of the census of 2010, there were 32,822 people, 13,243 households, and 8,623 families residing in the city. The population density was 1,334.2 people per square mile (515.3/km²). There were 15,198 housing units at an average density of 617.8 per square mile (238.6/km²). The racial makeup of the city was 48.7% White, 46.6% Black or African American, 0.3% Native American, 0.7% Asian, 0.2% Pacific Islander, 1.4% from other races, and 2.2% from two or more races. 4.0% of the population were Hispanic or Latino of any race. There were 13,243 households out of which 31.8% had children under the age of 18 living with them, 36.4% were married couples living together, 23.9% had a female householder with no husband present, and 34.9% were non-families. 30.1% of all households were made up of individuals and 9.5% had someone living alone who was 65 years of age or older. The average household size was 2.44 and the average family size was 3.03. In the city, the population was spread out with 26.9% under the age of 18, 10.4% from 18 to 24, 27.9% from 25 to 44, 23.0% from 45 to 64, and 11.8% who were 65 years of age or older. The median age was 33.1 years. For every 100 females there were 87.7 males. For every 100 females age 18 and over, there were 86.0 males. The median income for a household in the city was $33,120, and the median income for a family was $39,417. Males had a median income of $36,827 versus $27,001 for females. The per capita income for the city was $18,883. About 20.3% of families and 23.9% of the population were below the poverty line, including 39.7% of those under age 18 and 13.1% of those age 65 or over. Although Alabama is legally in the Central Time Zone, Phenix City's proximity to the larger city of Columbus, Georgia causes Phenix City (including its municipal government) and areas within a 10-15 mile radius (such as Smiths Station) to observe Eastern Time on a de facto basis. The character "Maggot" from E.M. Nathanson's novel The Dirty Dozen was from Phenix City. The 1955 film The Phenix City Story (directed by Phil Karlson) is a biopic film noir focusing on the rampant crime and corruption in the city (then called "the wickedest city in the United States") and the 1954 murder of newly nominated Alabama Attorney General candidate Albert Patterson. Ska saxophonist Rolando Alphonso of the Skatalites had a 1960s hit titled "Phenix City"
The town gained attention in 1999 when Phenix City National Little League advanced to the final of the Little League World Series. The city is mentioned in the film Driving Miss Daisy. The city is mentioned in the book The Silence of the Lambs in Chapter 12. The city is mentioned as a former bootlegging city by the character played by Robert Mitchum in the film Thunder Road. The 2008 novel Wicked City by Ace Atkins is set in Phenix City. The Brooks-Hughes House was added to the National Register of Historic Places on November 3, 1983. The Floyd-Newsome House was added to the National Register of Historic Places on November 3, 1983. The Morgan-Curtis House was added to the National Register of Historic Places on November 3, 1983. The Shapre-Monte House was added to the National Register of Historic Places on November 3, 1983. Phenix City, Alabama Facts for Kids. Kiddle Encyclopedia.